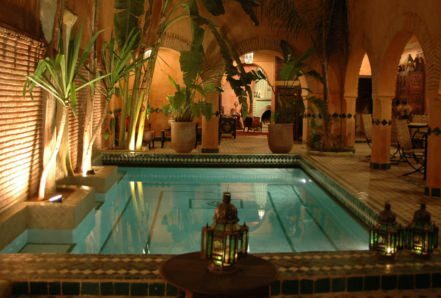 "This American-owned riad was once part of an Alaouite palace - the battlement niches are still in place - and is in a prime but quiet location just off Jemaa el Fna [the main square] and in the shadow of the Koutoubia Mosque. 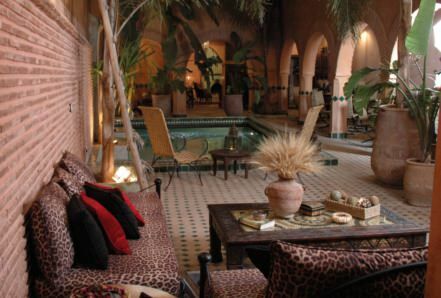 Peggy Ward Engh bought and carefully restored this ocher-colored riad in 2007, and through her personal touches and determination, has transformed the "Princess of Beauty" [the riad's name in Arabic] into a very special place. The large pool in the center courtyard is surrounded by tall, bird-attracting foliage and sets the tone for luxury. A small salon - furnished with sacred objets d'art from manager Rachid Izemreten's Middle Atlas Ait Ourayne tribe, a satellite TV with DVD, and a large wood-burning fireplace - also includes a library filled with English-language books and magazines on religion, Morocco’s architecture and decor, cuisine, and history. The rooms have all been individually decorated by Peggy and feature original Moroccan artwork, handmade Moroccan furniture and bed linens, spot lights for reading, and amenities such as full length mirrors, bathrobes, wash cloths, and bottled water. The riad also recycles as much as possible - note the potpourri and natural cleaning products, such as lemon, salt, and vinegar. Live-in staff are extremely friendly, hardworking, college-educated, and English-speaking. Rachid, who speaks English fluently, is a highly-regarded government-certified national tour guide, and is partner with Peggy in the tour company Morocco Custom Travel LLC. Cooking classes with Chef Hamidou are also available."